You can only loot one key every week. It is tracked by Loot Room Key Tracking Quest. This gets turned into Taoshi (51.4, 46.2), near the Shado-Pan Assault Quartermaster in the cave you find the Throne of Thunder raid entrance in. The key is used as a quest starter to begin Treasures of the Thunder King to queue for what's called a "solo dungeon". Once you queue, you're taken to a room where Taoshi asks if you want to begin the encounter. d tiny spiders that shoot a web at you, effectively rooting you to where you stand - and that's just the first room. In the second you will find It may be worth noting that a vendor near Taoshi sells a potion (Potion of Light Steps) for 1 Elder Charm of Good Fortune that will levitate you above the ground and allow you to avoid some of the traps around the room. (Potion of Light Steps) You have a time limit of 5 minutes to grab as much loot as possible, and once the time limit is up, you are teleported out of the area where the chests are. There, you are awarded a Burial Trove Key as a reward for completing the quest, which opens one of the various chests located around the NPC, which contain various articles of valuable loot. Sidenote: During my first run, I looted a second Burial Trove Key from the chests spawning around the room which allowed me to open a second chest at the end of the encounter. I also looted gold, Elder Charms of Good Fortune, Tattered Historical Parchments, 1 Shan'ze Ritual Stone, and many many Mote of Harmony. I recieved Abandoned Zandalari Arrowlinks from the chest I chose. When you receive Key to the Palace of Lei Shen, you would then want to find Taoshi located at 51.4, 46.2 in the Isle of Thunder, she will give you the quest Treasures of the Thunder King You would then turn the key into her. Upon doing so, she will Que you for a solo scenario in which the goal is to loot as many chests as possible within the time limit. These mentioned chests were along walls, near statues and lightning, and in places in which your toon will have to jump and land with accuracy and precision. Ps Some of the loot: Shado-Pan Assault Insignia, Tattered Historical Parchments, GOLD, Mogu Runes of Fate , etc. The Key to the Palace of Lei Shen is also lootable from Arcane Trove, one of the quest rewards from completing the final day's daily quest for the Isle of Thunder. As an example, here is a quest that awards the Arcane Trove: Among the Bones. Essence of the Breeze work in the palace of lei shen, it gives you a great movement boost for 10min, its quite useful and it also works in throne of thunder, found it useful for the first boss. Its probably gonna get patched soon though. This key takes you to a new single-player scenario, Troves of the Thunder King, in which players try to grab as much loot as they can from treasure chests before their 5 minutes are up. This is made harder by the presence of numerous challenging traps in the zone designed to attack and slow you down. I've uploaded a video of Lore from TankSpot explaining the mechanics of this run. Depending on what you are after, it may be more beneficial to just open everything in the first room and load up on gold and Burial Trove Key that unlocks chests in the final area you get sent to after 5 minutes are up. If you just skip everything and rush to the end boss, you'll miss out on looting a lot of chests along the way, but you'll get credit for part of In the Hall of the Thunder King. Tattered Historical Parchments, used to purchase reputation insignias such as Greater Kirin Tor Offensive Insignia. Shan'ze Ritual Stone, used to summon elites. Golden Treasure Chests appear to have the same types of loot but in more quantities, as well as Burial Trove Key. You'll need to open 10 in one run to complete a step of In the Hall of the Thunder King. When the time runs out or you complete the run, you'll be taken to a special area filled with Lei Shen's Burial Trove. You can only open these chests with Burial Trove Key. They have a chance to contain the rewards above as well as Shado-Pan Assault Insignia and Justice Points. Based on Blizzard's most recent patch notes, there is also a small chance to get epic loot! 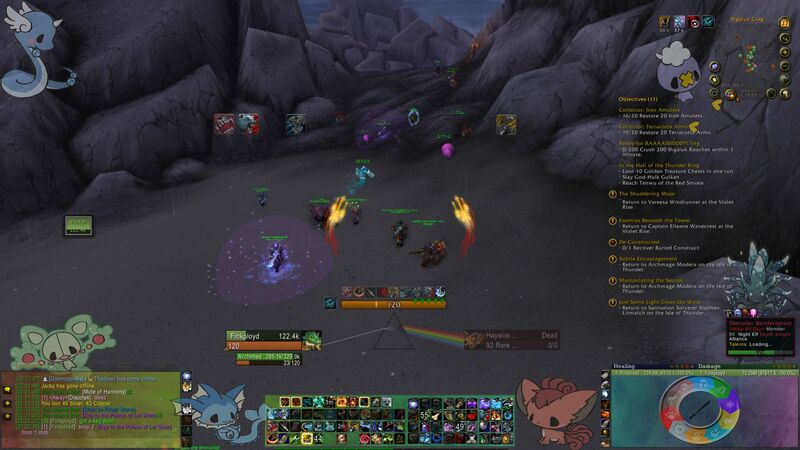 Users have commented that they get ilvl 502 items that would also be found in Treasures of the Thunder King, LFR versions of Throne of Thunder trash epics. The first room contains some basic pillar traps that periodically cast lightning (Lightning Surge), as well as Mogu statues that activate and do an AoE stun (Stone Smash) if you do not move away. Since lightning can slow, this can easily turn into a bad slow + stun combination. There are also Ashen Weavers that don't hit very hard, but can web you. The second room is more complex and has many tile traps (similar to the Ruins of Guo-Lai) as well as traps that port you several feet and begin to damage you if you step inside their radius. In addition, there are several NPCs present. Skumblade Pillager is the most interesting as he moves very quickly and can open doors for you, but can also be killed for In the Hall of the Thunder King credit. The third room adds the presence of Stone Watcher and Mogu Stone Sentry. At the end of the scenario, you'll fight God-Hulk Gulkan, who'll try to knock you back into all the harmful traps we've described along the way. Complete the scenario by talking to Tenwu of the Red Smoke off to the side, who is helpfully surrounded by Red Smoke Flare. He'll give you an extra Burial Trove Key. Potion of Light Steps/Potion of Light Steps: Can be used to levitate over tile traps, fall at a reduced speed, and walk on water during the Troves of the Thunder King scenario. Taking damage will break this effect. Requires Friendly, costs Elder Charm of Good Fortune. Sleep Dust/Sleep Dust: Puts the target in a magically-induced sleep for 25 sec seconds. Only works on humanoids and beasts within the Troves of the Thunder King secnario. Requires Honored, costs Elder Charm of Good Fortune. A Common Rock/A Common Rock: Can be used to distract an enemy or trigger a trap during the Troves of the Thunder King scenario. Requires Honored, costs Elder Charm of Good Fortune. Frost Rune Trap/Frost Rune Trap: Places a rune that will freeze the next hostile target to step on it for 20 sec. Only usable in the Troves of the Thunder King scenario. Requires Revered, costs Elder Charm of Good Fortune. Arcane Propellant/Arcane Propellant: Consume an arcane focus to launch yourself forward. Can only be used during the Troves of the Thunder King scenario. Requires Revered, costs Elder Charm of Good Fortune. This also has the added benefit of launching you into areas where you can loot otherwise inaccessible treasure chests. Polymorphic Key/Polymorphic Key: Magically reshape the key to fit any Ancient Gate in the Thunder King's Citadel for the Troves of the Thunder King scenario. Requires Exalted, costs 3x Elder Charm of Good Fortune. Absolute EASIEST way to acquire one of these Key to the Palace of Lei Shen is from the quest Setting the Trap, in my experience. Summoning the Echo of Kros with 3 Shan'ze Ritual Stone, will ensue a battle with him. Upon killing Kros he has a chance to drop the key loot-able by everyone in the group! (Usually 5 people). I recommend doing this on every toon, especially alts that could benefit from the amount of Elder Charms of Good Fortune you acquire during the Treasure solo instance. I just have a question. Upon completing this Tuesday - and leaving (whoops!) - I realized I had 3 Burial Trove Key. I'm assuming I can't go back in this week, unless I get another key? Assuming that, I should just hold them until reset and use them when I get another key. Right? It DOES make an overall difference, so don't overlook this important enchant before you enter the solo scenario Treasures of the Thunder King. It has been noted that Key to the Palace of Lei Shen are NOT one per week as perviously thought. The 1st key you should try to get is from mobs.. Rares are your best shot with the exception of Echo of Kros who has a 15% drop chance but all of the Rares have a 8-11% chance to drop, But Echo of Kros requires 3 Shan'ze Ritual Stone to summon so unless you are going to waste stones to summon him then rares are the way to go. except in the event that no rares dropped your key then you could use this as an alternate method of obtaining a key. The 2nd Key You could get is from your "one a week" Trove of the Thunder King that has a 29% chance to drop. Please note that once you loot a chest you will continue to be able to loot chests for an estimated 60 seconds before the game flag triggers for the week and marks you as having completed this objective. You could take time to scout out two or more chests and plan a rout that would allow you to loot multiple chests before the flag happens. Note that you cannot loot a chest in combat! The 3rd key you can get is from the Sunreaver Bounty or Arcane Trove respectively. However this is only a 4% chance to drop and is rare to get one even if you do the dailies all 7 days. Once you have your Key head to the objective on your map. When you are in the Palace you will find lots of chests.. some of these chests are named Golden Treasure Chest which have a 21% chance to drop a Burial Trove Key and are the more rare and harder to get to of the cheststhat spawn in the area. Another chest you may come across is a Mogu Treasure Chest which has a 23% chance to drop Burial Trove Key Some of these chests are out in the open and some require jumping skills and planning a path to avoid other obstacles to get to. You want as many of these as possible. Once your time runs out you will recieve an additional Burial Trove Key as a reward from Treasures of the Thunder King but you will only be able to complete this quest ONCE per week (Edit :as it would seem ONCE period. as my second week first key and no quest to turn in afterward.) So if you want more Burial Trove Key you have to find them on your run or thats it. These chests along with dropping 502 Raid finder gear that has a 13% chance to drop it also has the ability to drop aditional Key to the Palace of Lei Shen to allow you to simply leave and start over again. I can confirm that you can get more then one purple key out of these chests on a single run but this is again... RNG and extremely rare. The more keys you get the more chances you have at getting another run through. If RNG is on your side you could sit and do this all day. I would like to leave the suggestion here that in your first couple of attempts you shouldn't probably try to venture further than the first room. By just doing this first room you can get around 500g several Shan'ze Ritual Stone, around 15 Elder Charm of Good Fortune and even a couple of Burial Trove Key. If anyone like me have been looking for where to hand this in, you hand it in at Taoshi note that it seems you will not have access to her until stage 3. So if you like me are on a server that is still in stage 2, you will have to wait with doing your run for the throves of the thunder king. I can confirm that Key to the Palace of Lei Shen Can be obtained more than once per week, just got my second one out of Sunreaver Bounty and my first one of off Ku'lai the Skyclaw. Seems these can also drop from normal mobs. Just had one drop from Zandalari Commoner. Was just doing my dailies and I looted one from it. I just found one off of one of those Shan'ze Electrocutioners. (Shan'ze Electrocutioner) it doesn't show as an item drop on his loot list but i guess it should be on there with a very low drop rate. that was like winning the lottery without a ticket lol. Key drops in 80% from one of the bosses of weekly quest Champions of the Thunder King. Advise you compete this quest first, and only after kill rare monster if key didnt drop. One key is enough to complete full achievement In the Hall of the Thunder King and get a cap (20 pieces) of Elder Charm of Good Fortune. This video shows the fastest route for farming big chests and how to get a cap fo Charms in 5 minutes. Trying to get a Key to the Palace of Lei Shen but no one is around to help you kill a rare for a chance at a key? Best way I found is to wait for Goda to spawn, hit him once, and run straight to the Shado-Pan. They will help you kill him and do most of the work! According to the wowhead list, he even has the best chance to drop a key! I was getting absolutely zero luck from getting keys out of the Trove of the Thunder King around the island so this method works very well for my various alts! I just wanted to put this out there for anyone else who gets their key every week from rares/Trove of the Thunder King. Although the keys do not have a 100% chance at dropping from any specific rare or chest, you can significantly increase your odds at getting multiple keys a week. I used to farm 1 key a week for my 12 90s, whichever source I got it from didn't matter, I would always open at least one Trove of the Thunder King. A few weeks ago I had 2 toons not get their chest because the weekly quest flagged as completed when I killed and looted a rare with a key in it's loot. The following week I killed a rare and didn't loot it in case there was a key in the loot and I didn't want to chance not getting the chest for the extra gold and the Elder Charms of Good Fortune I like to save in the Fortuitous Coffer to buy extra Sunreaver Bounty with. So I devised a plan that has worked 10/12 times the last 2 weeks. First kill 2 rares and do not loot them, second, find 2 chests, do not open the first until after finding and opening the second so you know exactly where to run to for the other chest in case the first you open does not have a key (the chests have a very high chance at getting a key but will almost never contain one if you have looted one from a rare first and I have found I can't get a key to drop from rares or any mob on the island if I loot one from a chest first unless the mob is already dead before I open the chest and loot the key), so last go loot the rares and one of them hopefully had a key in their loot! Despite Blizzard's best efforts I have just received one of these in a Sunreaver Bounty. This was of course post 6.02. The Troves of the Thunder King scenario will be an important element in obtaining the Subtlety Rogue Hidden Artifact Weapon Appearance (Tome of Otherworldly Venoms). See the spoiler tag below for more details! Your Class Order Hall in Legion will have various tiers of upgrades that can be unlocked with Order Resources. Training The Vault costs 500 Order Resources; switching to it if you selected the other upgrade costs 2000 Order Resources. You need to be level 105 to train this upgrade. Inexplicably, despite the fact that Key to the Palace of Lei Shen was supposedly removed from the game, these keys are still obtainable from Sunreaver Bounty (Horde) and Arcane Trove (Alliance). These chests are available upon reaching Exalted reputation with the Sunreaver Onslaught or the Kirin Tor Offensive, respectively. The Sunreaver Bounty/Arcane Trove are sold by Vasarin Redmorn (Horde) and Hiren Loresong (Alliance), the respective quartermasters for their factions. The drop rate for these keys within the chests is NOT 100%. As such, you may need to invest many Elder Charm of Good Fortune to obtain one. Nonetheless, this may prove to be helpful for those still gunning for the Legacy achievement In the Hall of the Thunder King. These are still dropping in the Alliance Arcane Trove boxes when bought from the vendor with Elder Charm of Good Fortune. Given the low drop rate on the currency for buying these boxes, I'd say the loot rate for a key is probably pretty small based on my experience below. - I gathered over 10,000 gold with 22 keys, averaging about 400-650 gold per key. It used to be way more when Shan'ze Ritual Stone were worth 10g instead of the 1g they are now. Just got one by turning in a daily, from the first Sunreaver Bounty while become revered. Just looted this yesterday from Arcane Trove. Confirming that this item ( Key to the Palace of Lei Shen ) still drops. Received one today from a Sunreaver Bounty. Either Blizzard is lying to their gamer community, or they are a bunch of idiots, or both. I vote for "both". AFTER GETTING THIS I WENT AND PICKPOCKETED FOR Marin Noggenfogger's Lucky Coin. THE COIN LETS YOU PICK ANOTHER ITEM FROM THE VAULT. I THEN PICKED UP THE KEY AGAIN. FOR ALL WHO DO NOT KNOW IF YOU GIVE THE KEY TO Taoshi. You'll be directed to the single player scenario. The scenario has a chance to drop the Subtlety's hidden appearance. If you're a Rogue and get it through the Vault Ticket there's no need to make the trip to Pandaland. Just go to the Chamber of Shadows and talk to Taoshi there and she'll queue you up. Keeping up with recent comments, received one just now from Arcane Trove. "An ancient key to a secret entrance in the Thunder King's Citadel. The Shado-Pan would be interested in this."